Gucci is pleased to announce the launch of a new capsule collection available exclusively on Gucci.com in collaboration with the talented British artist known as Unskilled Worker. Gucci’s relationship with Unskilled Worker, the nom de plume of Helen Downie, dates back to 2015, when Creative Director Alessandro Michele discovered her work on Instagram and invited her to participate in an art exhibition in Shanghai. Since then the artist has created a stronger bond with the House, which is now to be expressed in an innovative collaboration. 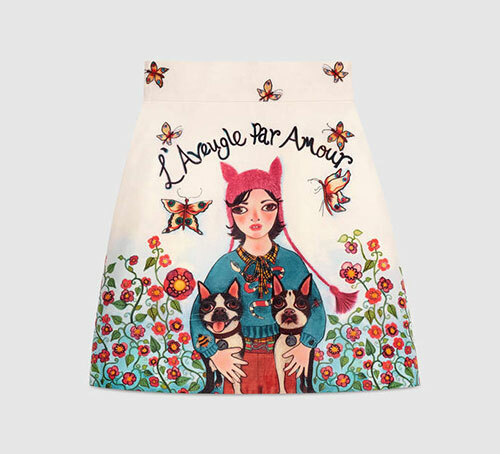 This takes the form of a 40-piece exclusive capsule of ready-to-wear, shoes, bags, silks and accessories featuring artwork by Unskilled Worker. The images used are a combination of portraits and floral designs by the artist, in all in her signature naïve and expressive style. These works have a witty, playful spirit that perfectly complements the contemporary, eclectic Romanticism of the House. “Orvieto has been a very important part of my painting. It was a catalyst. It’s a very beautiful, outrageous place,” Helen Downie. Exploring the world of artist Unskilled Worker in a video (below) directed by Hill & Aubrey, including the Umbrian city where she paints in a studio over summer. This is real art!